Many people toss away eggshells or throw them in the dust bin but in the case of egg, the eggshell is as good as the egg white and the yolk. 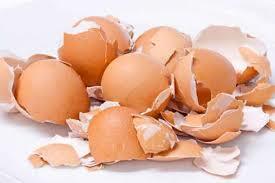 Eggshell is a great, natural, and inexpensive source of calcium as it contains 90% of the mineral. Calcium is the most abundant mineral in the body and the are mostly found in our bones and teeth. Calcium also plays an important role in muscle contraction, nerve health, enzyme activity and cell formation. Eggshell powder is a great opinion to get more calcium into your diet without adding more calories to your diet. Half a teaspoon of the powder contains about 1,000 to 1,500 milligrams of calcium which equates to 90% of the daily recommended amount. The National Institute of Health found that eggshell powder provides many great benefits for the human body. It strengthens bones and assist the body in producing healthier cell also reducing cholesterol and blood pressure! In women who dread having osteoporosis(loss or brittle bone in aged women), dietary calcium in food and taking calcium supplements can help, but if you are genetically predisposed for osteoporosis it may not do the trick. Medications available to treat osteoporosis, have all kind of side effects that can impact your health negatively in other ways but naturally you can get all the needed calcium from eggshells to help fortify your bones against osteoporosis as it either increases your bone density and/or stop further bone loss(Amazing isn't it)!. According to the research conducted by the National Institute of Health, it was concluded that eggshell powder has a significant positive effect on bone and prevention and treatment of osteoporosis. Eating eggshells has also been linked to quickly decreasing pain in those afflicted with joint problems and keeping that pain away as time goes on. If you are looking for a powerful and environmental friendly cleaner for pots and pans, look no futher than eggshells. By blending eggshells and mixing them with soapy water, eggshells make an outstanding abrasive cleaner for your dishes. One of the many different uses of the eggshell is that it serves as a natural stain remover. Eggshell has the ability of removing coffee or juice stains instead of going through the stress of washing or using synthetic cleaners(which though tends to be toxic), carefully smash the shells, sprinkle them over the stain, add some warm water and allow the eggshells do its magic by absorbing the stains. In some parts of the world, the egg white and yolk are carefully removed from the egg through a small hole, and the remaining eggshell is used for creating Easter or Christmas decorations which is a great, efficient and cost-effective way to make decorations. You can blend your eggshells to powder and add it to your nail polish to make it even more stronger and more durable. On the other hand, you can use the crushed eggshells for creating a natural and efficient facial scrub that will not only remove all the d*ad skin and cells, but will also reduce the look of wrinkles, giving your skin that soft smooth 'baby skin' look. The high calcium contents present in the eggshells is perfect not just for making natural supplement, but also for fertilizing your garden. By crushing and sprinkling the eggshells into every hole prior to planting, increases the chances for your plants and veggies to strive. Crush some eggshells, combine them with several lemon slices and put them in a cloth bag along with all your clothes in the washing machine. Your white clothes will stay white for longer. These and many more are the uses of eggshells so before you toss them in to the bin when next you're cooking, pause and think of other enormous uses they serve.